The management of chronic ruptures of tendo Achillis often requires augmentation techniques. These can be performed using a turn down flap, a tendon transfer, tendon graft, or synthetic materials. Open procedures on the Achilles tendon can lead to difficulty with wound healing because of the tenuous blood supply and increased chance of wound breakdown and infection. 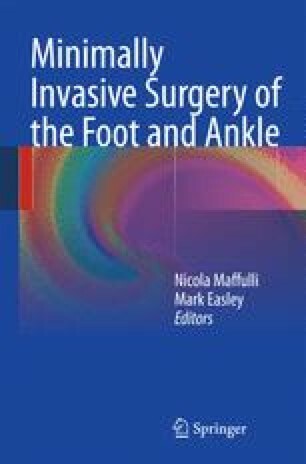 In this chapter we describe a method of minimally invasive semitendinosus reconstruction for the Achilles tendon. This technique uses one proximal para-midline incision and one distal midline incision preserving skin integrity over the site most prone to wound breakdown. The first incision is a 5 cm longitudinal incision, made 2 cm proximal and just medial to the palpable end of the residual tendon. The second incision is 3 cm long and is also longitudinal but is 2 cm distal and in the midline to the distal end of the tendon rupture. The distal and proximal Achilles tendon stumps are mobilised. After trying to reduce the gap of the ruptured Achilles tendon, if the gap produced is greater than 6 cm despite maximal plantar flexion of the ankle and traction on the Achilles tendon stumps, the ipsilateral semitendinosus tendon is harvested. The semitendinosus tendon is passed through small incisions in the substance of the proximal stump of the Achilles tendon, and it is sutured to the Achilles tendon. It is then passed beneath the intact skin bridge into the distal incision, and passed from medial to lateral through a transverse tenotomy in the distal stump. With the ankle in maximal plantar flexion, the semitendinosus tendon is sutured to the Achilles tendon at each entry and exit point. This minimally invasive technique allows reconstruction of the Achilles tendon using the tendon of semitendinosus preserving skin integrity over the site most prone to wound breakdown, and can be especially used to reconstruct the Achilles tendon in the presence of large gap (greater than 6 cm).